Engineering/Robotics - BrewTech Robotics Inc.
Our Engineering and Robotics team is in charge of designing, building, and testing and strategic planning of the robot. "The Work Bench" was the place where everything about the robot was actually done. 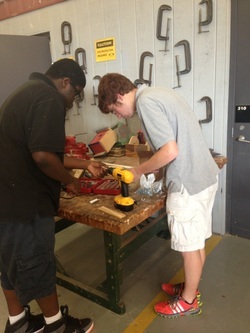 Johnathan and Ben are working on the end-effect0r and claw design for this year's GateKeeper robot. 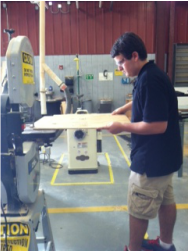 Here, Chandler is cutting the base for this year's robot. Here at BTR Inc., we are all about safety. Notice that Chandler is wearing his safety goggles while cutting the wood.